VB-4 is designed to block road noise! VB-4.5 is a lightweight, composite product that has been engineered to block and reflect high energy, low frequency road noise, an airborne sound, across a wide frequency range. 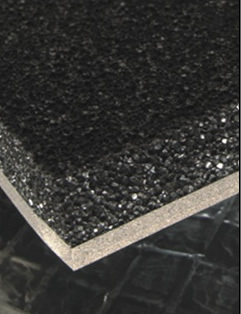 VB-4.5 consists of a closed cell neoprene foam layer that is bonded to a dense .5lb ft² vinyl barrier. Conversely, VB-4.5 will prevent sound energy from escaping the vehicle which may be of particular interest to those of you who compete in car audio competitions. Where do I use VB-4.5? VB-4.5 is used primarily on flat areas of the floor pan and on the floor of the trunk or cargo area. VB-4.5 is installed onto the floor pan with the neoprene foam side down facing the floor pan. A common misconception is that vibration damping sheets are designed to block road noise, an airborne sound problem. Although this technique can yield a reduction in the overall noise floor, it requires 2-4 layers of material which will increase the cost, installation time and dramatically increases the amount of weight added to the vehicle. Save yourself a lot of time, money and hassle by using a dedicated "floating" barrier material first. VB-4.5 weighs .5lb ft² and is equivalent to 4 layers of a vibration damping sheet.